Woot woot! My store got a huge product drop today of all the new pretty May items. #1 on my list was the Heathered Jewelled Magenta Define Jacket. They also had the Jewelled Magenta Swiftly Tech LS’ and Pedal Pace Tanks and Bras. I pretty much have to return the Tracker III Shorts I got last week and probably a another item to make room in my budget. This was love at first site. I size up in the Define Jacket to a 12 from my typical size 10 everything else and it’s still pretty fitted, just has breathing room. 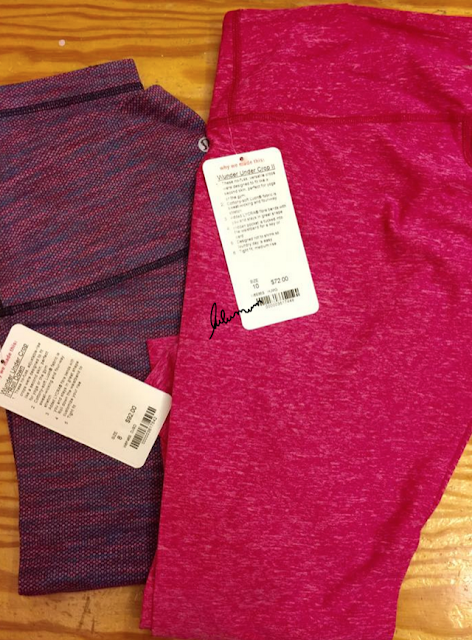 New pretty wunder unders in store! The Jewelled Magenta are regular waist, and light soft and thin. The Diamond Jacquard Jewelled Magenta/Iris Flower is soft, cottony, thick and Opaque. My try ons here are size 8 for the Jacquard (only ones on shelf) and size 10 in the Jewelled Magenta. These were amazing on. They are size 8’s and fit fine but I opted to grab the 10’s instead when I saw a lady put them back on the shelf. Sucka! They are very vibrant in person and the colors really speak to me. My daughter took this picture for you and actually, she got a better representation of the color than I did. 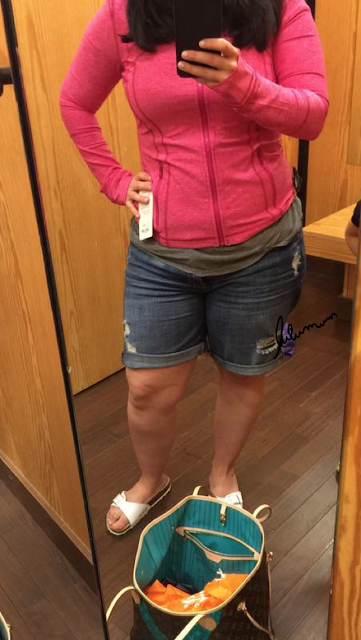 These were really soft and silky on and light, perfect for summer. They are a bit sheer though but for me the kicker was that it showed all my lumps and bumps. If you want smoothing, go with the Diamond Jacquard instead. If you are toned and lumps and bumps showing aren’t typically a problem for you then you will love these. The Iconic Wrap in Blue Denim is super pretty in person. I grabbed it, but it definitely put me over the budget for the entire month so I think I’m going to return it. It is a knit Boolux fabric so it’s the Iconic *Sweater Wrap. Canada finally got the Heathered Regal Plum On The Daily!! I thought I wouldn’t like it as much in person as it appears to be a bit washed out with the marled/heathering but actually, I do love it. It’s vibrant, pretty and very soft. Definitely considering this one. New Ebb to Street Tanks where in store. I was surprised to see Gator Green which we previewed this morning on the Australian upload. They had it next to last winters Fuel Green which is quite a bit bluer and both where very pretty. 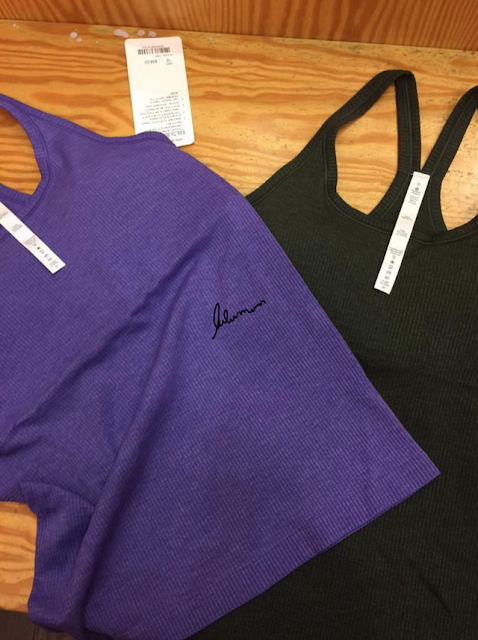 If this color comes in a Cool Racerback, solid or heathered, I’m in. 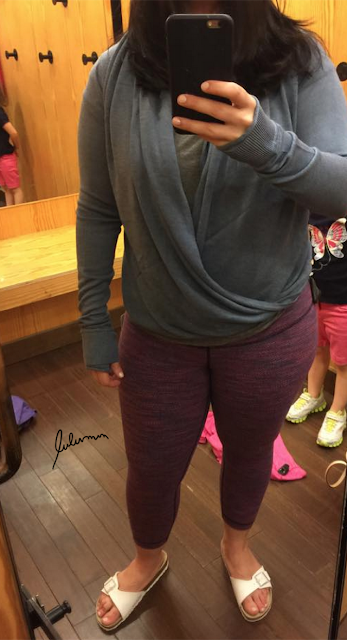 Lululemon Stocks Plummet 18%. Are We Surprised? 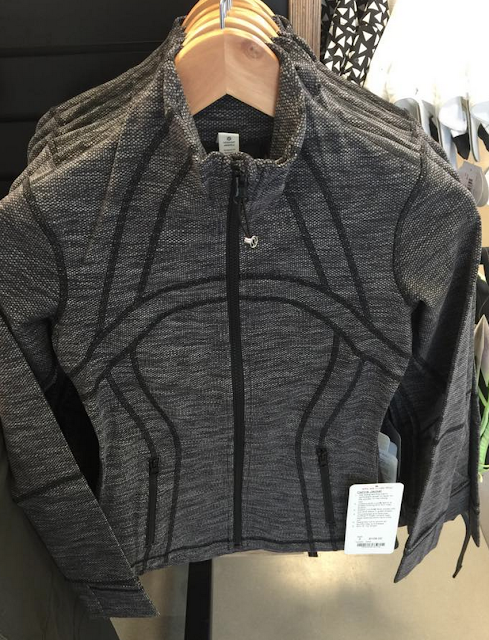 "Seawheeze 2015 Shorts, Jewelled Magenta Define Jacket, Iconic Wrap and More"
I went to my store, North Hills, today. Nothing. All the CRBs in anything pink were sold out in my size (10). No Define, which is what I wanted. Now I want those Jacquard Roll Down Wunder Under Crops, I'm in serious need of new crops for yoga that don't have mesh! Hi there just wondering if you found the diamond jaquard Wunder unders as thick as the ones they released in the winter? I found the winter ones very compressive in my usual size. Because I would like to order these if they are uploaded this week! Hi! They are. They are the same as the Tomato red ones from winter. Thick and compressive and very smoothing. Those Jacquard WUC look very cute , but to me it doesn't make any sense to buy a pair of textured pants in the middle of May/almost summer! I know, they are maybe a touch warm for summer but for me I wear crops year round for crossfit with the exception of a week or two in summer when it's unbearably hot. These where definitely an impulse purchase for me that I need to keep on my 'maybe' pile even though I love them. Oh I am so jealous that you got a hold of the RP On The Daily Hoodie! I so hope it gets uploaded tomorrow!!! Fingers crossed! oh goody – the new purples will go with my WUC from winter that were reddish/bumbleberry mixed with purple – may be a bit hot for summer but nice to know I can pull them out for an occaisional wear. 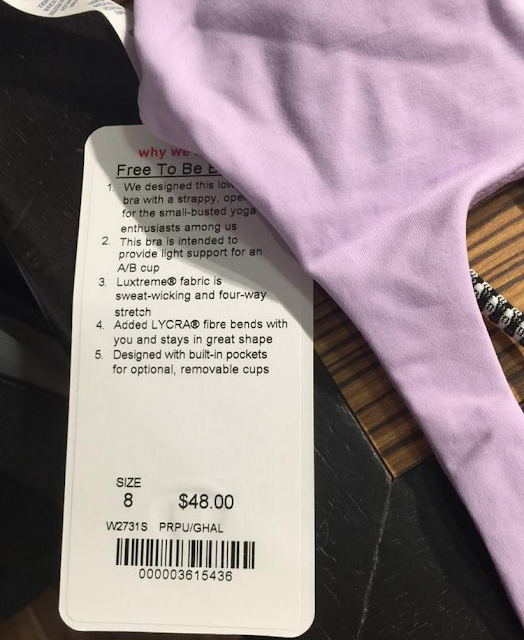 I love the FTBW bra – getting that colour for sure! What store had this product drop? Thanks! Coquitlam Centre in Vancouver, BC. Most Canadian stores should have this stuff today, if not then tomorrow. I know Halifax does. I know US got the Define Jacket and Iconic Wrap so I'd look out for that for the upload tomorrow. Should be both sides. 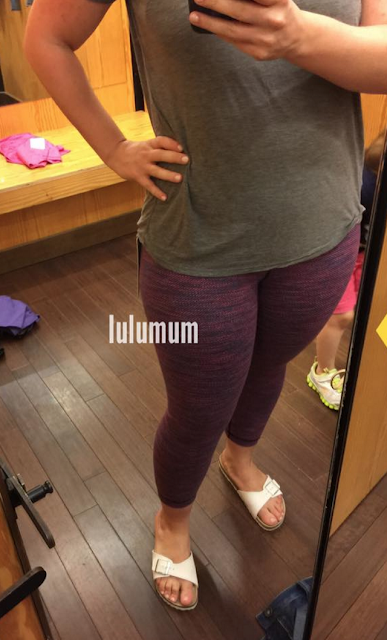 Hi Lulumum, everything looks great on you! 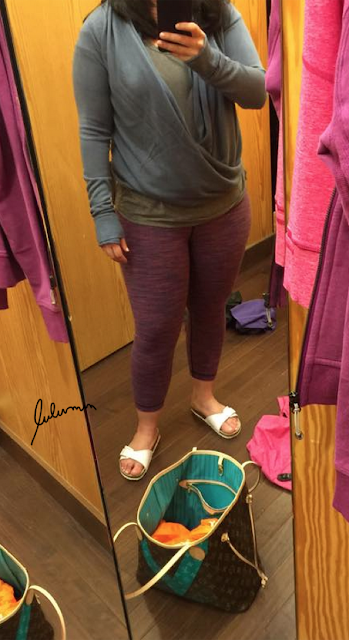 I'm just wondering if you can tell me if you would recommend ordering my usual Lulu pants/crops size or a size up? I've never tried textured Lulu bottoms before, so I'm not sure, and I remember a lot of people talking about sizing up in the Flaming Tomato crops this fall/winter. Thanks Lulumum! Hey! They are not a size up IMO. They are compressive, but that is what makes them smoothing. 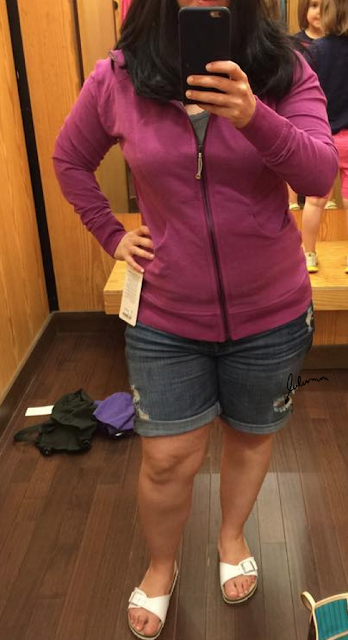 I purchased my TTS size 10, but the try on photos I have here are size 8, my size down. The size 8's felt perfectly fine on and looked acceptable but I opted for my TTS 10.